Covering a robot with sensors requires a technology that is both flexible and cost-effective to manufacture in bulk. MIT’s Computer Science and Artificial Intelligence Laboratory’s researchers think that 3-D printing could be the answer. In an attempt to demonstrate the practicability of such electronics that combine sensors and processing circuitry and can act on their environs, the researchers have developed a device that responds to mechanical stresses by varying the color of a spot on its surface. The device was inspired by the golden tortoise beetle, or “goldbug.” It is an insect whose exterior usually looks golden but changes to reddish orange if the insect is nudged or poked — that is, mechanically stressed. “In general, networks of sensors and interconnects are called sensorimotor pathways,” says Subramanian Sundaram, who led the project. “We were trying to see if we could replicate sensorimotor pathways inside a 3-D-printed object. So we considered the simplest organism we could find.” Subramanian is an MIT graduate student in Electrical Engineering and Computer Science (EECS). 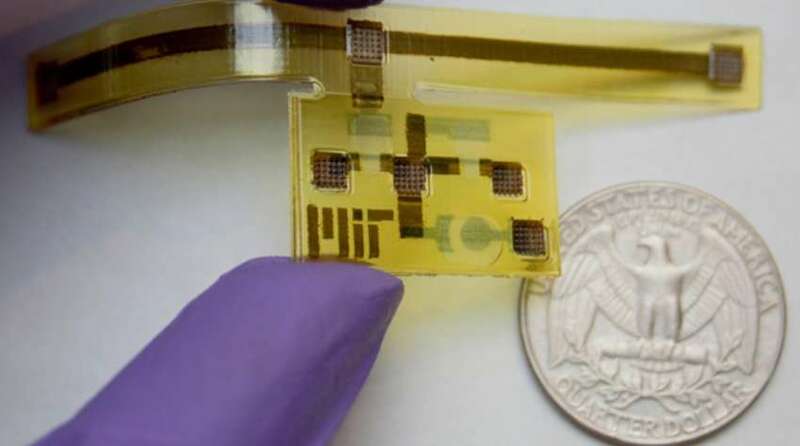 The MIT researchers’ new device is roughly T-shaped, but with a wide, squat base and a lengthened crossbar. The crossbar is prepared from an elastic plastic, with a strip of silver running its length; in the researchers’ experimentations, electrodes were coupled to the crossbar’s ends. The base of the T is made from an extra rigid plastic comparatively. It contains two printed transistors and what the researchers call a “pixel,” a circle of semiconducting polymer whose color changes when the crossbars stretches, modifying the electrical resistance of the silver sliver. “You wouldn’t want to connect all the sensors to your main computer, because then you would have tons of data coming in,” says Sundaram. “You want to be able to make clever connections and to select just the relevant signals,” he adds.